Are you dealing with food intolerances? Or just dealing with being on a special diet? I know a lot of people think it’s boooring to live a healthy lifestyle. Or that you’d be very limited when having, say, gluten or lactose intolerances in the family. Add drastically reducing your sugar intake to that – and you might think that all of this is equal to “never treating yourself to anything good in life”. Recognize these thoughts? Now let’s turn the whole thing around! I’ve heard of a boy who is allergic to everything except elk meat. OK – in that case, we are really talking limited diet! But the rest of us? We normally have a lot more to pick from! So how about you make a list of all the stuff you can actually eat, and still live healthy. If you start now, and work through the night, you might be done by tomorrow evening. How about carrots? Did you know there are loads of things you can actually cook with carrots? I have a blog post called “7 days – 7 ways to cook carrots”. Check that out to get some new ideas! If you have eggs on your list as well, you are lucky! 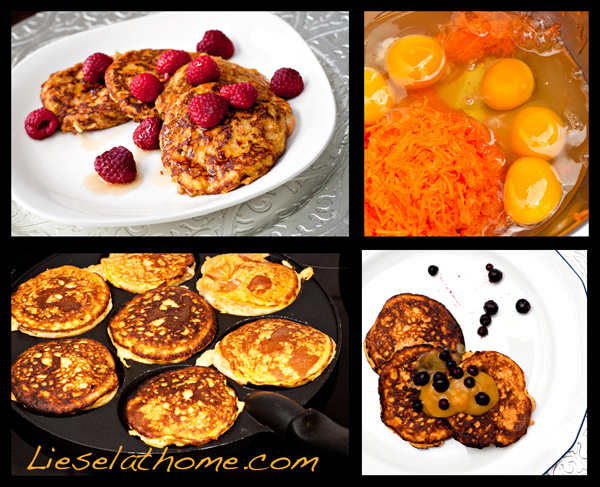 Combine the eggs with carrots and you have the most delicious pancakes ever. and possibly 1 teaspoon of baking powder (mixed with the coconut flour) But if baking powder is not on your list – no worries it’s not a deal breaker! Mix together and fry on medium heat in butter, coconut oil or ghee. (Or bacon fat, or possibly goose fat if you have – lovely!) No pancake iron? Just make four or five little heaps in a normal pan. Turn after a minute or two. Serve with berries or fruit spread. Naturata (and also dm in Germany) has a wide choice with 100% organic fruit – no added sugar or anything else. Just the good stuff! So there you go! A healthy way to start your day! Possibly even a way to start your new healthy life? Lisa Fuchs normally writes about healthy and creative baking, under the name Liesel on her blog: lieselathome.com. You will never find sugar or gluten in any of her recipes and most of them are also lactose free. These look delicious! I’m lucky not to have any allergies, but it’s always good to have tried-and-tested recipes for when friends with intolerances come to stay.